Patrick Regan returns to Your Stupid Minds after his appearance in Jonah Hex (both the episode and the movie) to help us review Universal’s 2010 flop The Wolfman (back when Universal used to make flops). This episode is part of our de facto ghoulish Halloween theme, when we review some scary movies in October and then go back to other things. Lawrence Talbot (played by the excessively British Benicio Del Toro) receives a visit from his sister-in-law Gwen (Emily Blunt), who tells him his brother is missing. After some reluctant hero hemming and hawing, he takes the train back home to his bizarre father Sir John Talbot (Anthony Hopkins) where some spooky doings are transpiring. His brother was ripped to shreds and the locals suspect either a gypsy bear or a werewolf. During a visit to the gypsy camp, Lawrence is bitten by a werewolf and later transforms into a werewolf. Then Hugo Weaving shows up as a Scotland Yard inspector and we glacially proceed to the giant London action set-piece and inevitable Marvel-style werewolf fight. 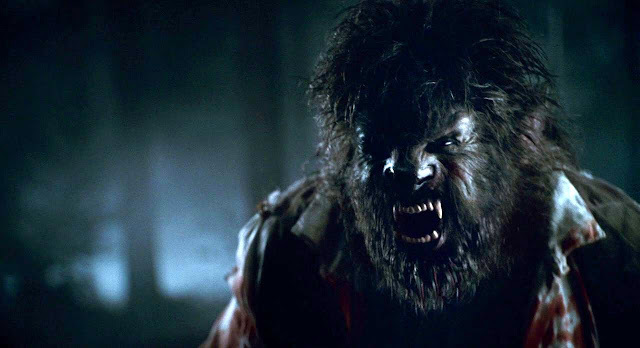 The Wolfman was conceived in 2006, passed from director to director for two years, began production in 2008, and then dumped into a February 2010 release. The CGI bear is actually reused polar bear computer effects from The Golden Compass. Regardless of what you think of this movie, the asylum transformation scene is fantastic. We apologize to all of our Romani listeners. We don't think you steal atlases from the reference section of the library and cook them. Newspaper Headline: UNDERSTUDY SCORES BIG IN HAMLET. We also apologize for spoiling the secret ending of Sicario.